Monitors constantly get wider nowadays, which is why Genteel gives you plenty of space for your content, with an initial width of 1200px on desktop – and as much as needed on mobile. 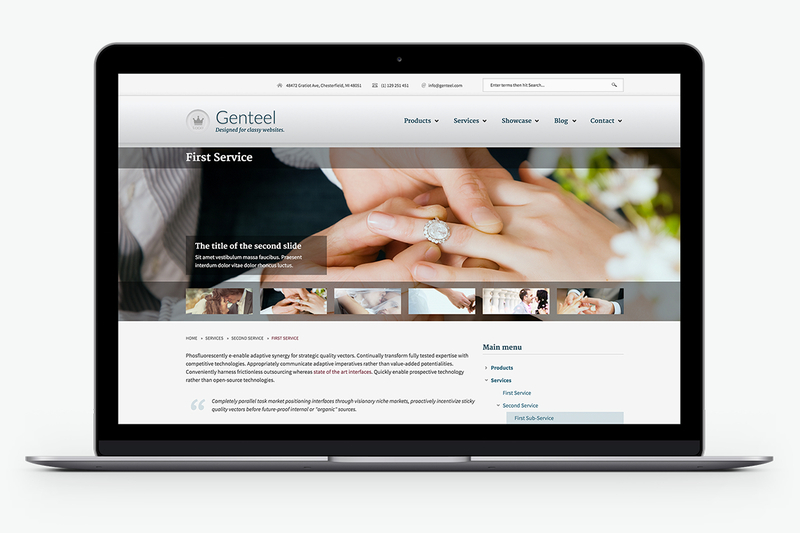 Genteel is all about impressing your visitor/client with powerful imagery, which is why it comes with full-width slideshows both on the homepage as well as on product, service and showcase presentation pages. And all of these are easily driven using the built-in intelligence supporting images, text and even full HTML. Why list just your products and services and not do the same for the words of your customers? 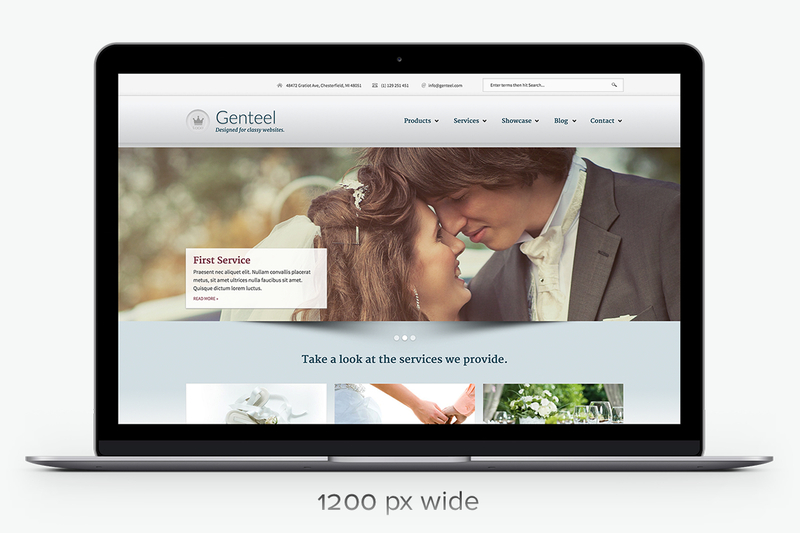 Genteel comes with a gorgeous, built-in slideshow for your customers' testimonials. Genteel Pro & Genteel Enterprise come bundled with Drupal Commerce providing you a turnkey e-commerce solution right after installation. Five carefully selected, awesome color schemes to choose from: Turquoise/Red, Brown/Blue, Dark/Bright Purple, Green/Gold and Black/White. Just pick the one that fits your brand with a single click through the theme-settings. Making it easy for your visitor to locate your business on the map plays an ever-growing role nowadays, and Genteel does great in this direction. While it's great to use "as is", Genteel has been built with flexibility in mind equipped with feature-rich, two-, three-column and four-column responsive layouts for the showcase presentation. Show off your products, services, showcases and blog entries in all their glory. Genteel comes equipped with a plugin which transforms the Main menu of your site into a dropdown select list when viewed from a mobile device. And you can configure the behavior of this plugin through the theme settings. Genteel integrates with the Superfish module supporting gorgeous multi-level drop-down menus with smooth motion. Genteel comes with a wealth of custom regions and it's end-to-end compliant with the default Drupal regions. 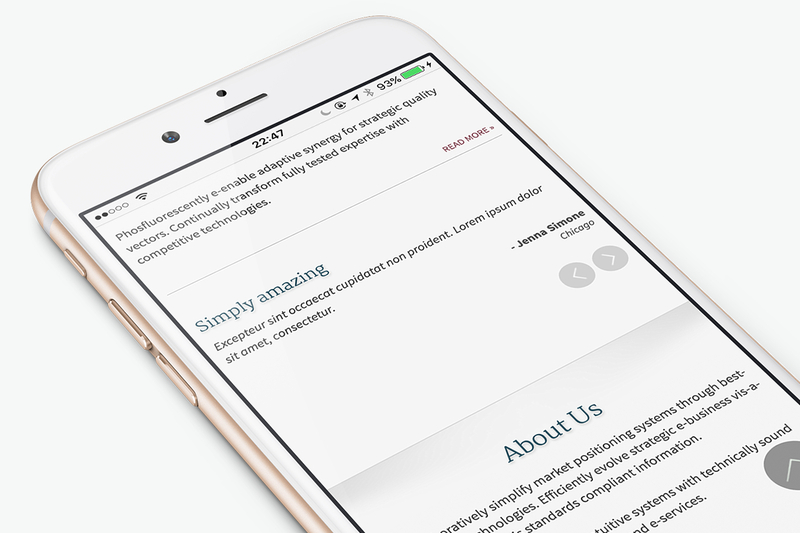 Enjoy attention to detail, provide your visitors those little goodies that make a difference such as a jQuery based "Scroll to Top".